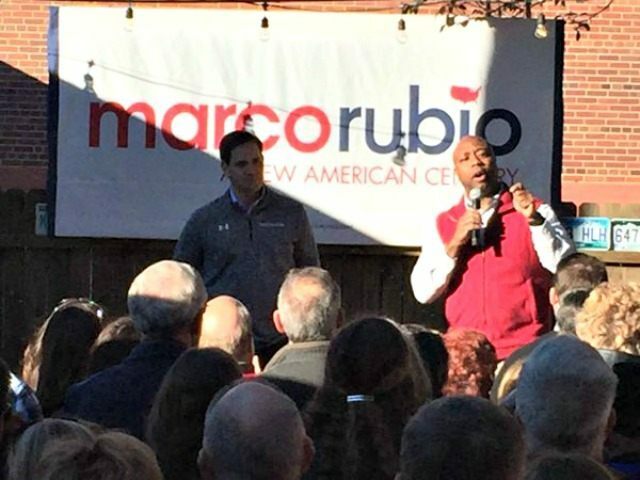 In Derry, New Hampshire last night, Senator Marco Rubio was introduced by Rep. Trey Gowdy and Sen. Tim Scott, two South Carolina congressional Republicans who have endorsed him. Rep. Trey Gowdy, the Chairman of the House Benghazi Committee, praised the freshman senator for his respect for the rule of law. “I want a president that actually enforces the law and I want a commander of chief that I can actually be proud of,” he said. Gowdy explained to the crowd that the two biggest responsibilities of a president are national security and law enforcement. After Scott took the microphone, he explained that he met with and hosted twelve Republican presidential candidates in South Carolina before he decided to endorse Rubio. Scott shared a bit of his own life story, flunking high school before meeting a mentor who helped him get his life on track. “Marco Rubio reminds me of that mentor, because he inspires a new generation of voters, but he does so by holding on and anchoring himself to our conservative principles,” Scott said. “I think while we are suffering through seven long years of President Obama, it is time to avoid four long years of Hillary Clinton,” he said. As Rubio prepares for the primary in South Carolina, Gowdy and Scott are two South Carolina political allies that will be crucial to his campaign.